Posted on March 20, 2019 by On a Higher Note. Graham Audio named On A Higher Note as their North American exclusive distributor with North American debut of the new LS5/9f floor standing loudspeaker in Salon Audio Montreal Audio Fest in Quebec, Canada. Graham Audio is proud to announce On A Higher Note as their new exclusive distributor for United States and Canada and will kickstart the representation this weekend with a worldwide debut of its new LS5/9f floor standing loudspeaker in Salon Audio Montreal Audio Fest. In Room # 1315 at the Hotel Bonaventure in Montreal, Quebec. “We are delighted to join On A Higher Note’s distribution network to widen and deepen our brand following in North America. We look forward to seeing more music lovers and audiophiles alike, make the emotional connection to their music, while feeling the passion and the soul of the human voice through our family of loudspeakers, to include Graham Audio, Chartwell, and Swisstone”, Paul Graham remarked. “Ever since I first heard the Graham LS5/9, I have been smitten by the holographic image of the performer in the room. Distributing Graham Audio is a natural step for me as I am a music lover at heart and audiophile by necessity, moved by the lifelike reproduction, the natural tonal color and the superb fit and finish of this loudspeaker line”, Philip O’Hanlon professed. Originally developed at a cost multi-million budget in today’s numbers, the legendary BBC monitors were produced through the most intensive R&D program in loudspeaker history. The latest generation Graham Chartwell LS3/5, LS5/9 and LS5/8 are carefully crafted by designer Derek Hughes, using modern speaker technology. Mr. Hughes developed the new LS5/9f for Graham Audio from the experience gained whilst recreating the BBC LS5/9 to meet a popular demand for a precision monitor loudspeaker like the 5/9 but in a floor standing version. 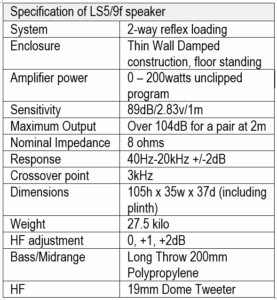 Built to the same exacting BBC standards the LS5/9f is created using the damped thin wall principle with rubberised acoustic barrier and rockwool damping. The crossover is 2nd order on the bass and 3rd order on the treble, same as the standard LS5/9. The stereo picture and dynamic range are superb and a review in “Sound on Sound” commented “the sound hangs in the space between the speakers like an invisible band or orchestra”. The midrange performance is almost identical to the award winning LS5/9. While the bass enjoys 5 Hz of lower extension, the greater bass amplitude provides a deeper foundation underneath the music. This entry was posted in Press and tagged 2019, Graham Audio, Graham US and Canada distribution. N. America Gryphon Announcement re Diablo 120 Integrated Amplifier – Now at US$9,990!